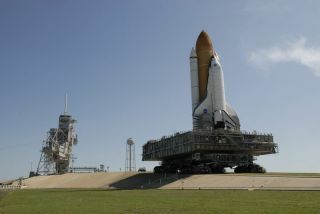 The spaceshuttle Endeavour rolled from one Florida launch pad to another on Sunday inpreparation for a complicated June construction flight to the International Space Station. NASA parkedEndeavour atop the seaside Launch Pad 39A at the Kennedy Space Center in CapeCanaveral., Fla., at 11:42 a.m. EDT (1542 GMT) after a more than eight-hourtrek from its previous perch. Endeavouris scheduled to blast off on June 13 to deliver a porch-like experiment platformto the space station that will complete the outpost?s Japanese Kibolaboratory. Five spacewalks are planned for the marathon 16-day mission toinstall and outfit the new experiment porch and deliver vital spare parts. NASA movedEndeavour to Pad 39A from the nearby Launch Pad 39B, where it had been onstandby to fly a rescuemission for astronauts aboard its sister ship Atlantis in case anunexpected emergency occurred during their recent mission to overhaul theHubble Space Telescope. No rescue was needed and Atlantis landed safely inCalifornia on May 24, but bad weather has delayed its ferry flight back atop amodified jumbo jet. Launch pads39A and 3B are only one mile (1.6 km) apart from point to point, but NASA?s massiveApollo-era crawler carrier vehicle had to haul the 100-ton Endeavour along a3.4-mile (5.4-km) path that links the two launch sites. It was only the fourthtime in NASA?s 28-year history of shuttle flight that a shuttle swapped launchpads. Endeavour?smove also marked the last time in history a shuttle was parked atop Pad 39B.NASA is converting the shuttle launch site to host its new AresI rocket and Orion crew capsules. Substantial modifications are requiredbefore the first planned test flight, Ares I-X, no earlier than Aug. 30. The cargo forEndeavour?s mission was already at awaiting the orbiter?s arrival at Pad 39A.It will be moved into the shuttle?s 60-foot (20-meter) payload over the nextweek, NASA officials said. Endeavour?sseven-astronaut crew, commanded by veteran spaceflyer Mark Polansky, is dueclimb into the shuttle on Thursday during a launch dress rehearsal and an emergencyescape drill. The shuttle?sSTS-127 mission to the space station will mark NASA?s third shuttle flight offive planned in 2009.